Sprowston forms the larger part of the north-east of the city of Norwich. It stretches pretty much from the inner-ring road until it melts into the fields three miles out on the edge of the city. If it was a town in its own right, Sprowston would be the fourth largest place in Norfolk. The churchwarden of one of Sprowston's Anglican churches tells me that people prefer to think of it as suburban Broadland rather than suburban Norwich, which I thought was rather nice, and showed a certain amount of pride in what is far from an anonymous suburb. Norwich, of course, is home to East Anglia's Catholic cathedral, and, as is the way with Catholic cathedrals, the cathedral is also a parish church in its own right. The only other Catholic parish in the city is this one. As befits its status, St George is a grand, architecturally articulate church of 1962, in a prominent position dominating the ridge of the hill. The designer was AJ Chaplin, and it is ironic that the great post-war expansion of the Catholic Church in East Anglia happened on the eve of the changes that would be wrought in the shape of the liturgy by Vatican II, and which would lead, later in the decade, to changes in the way in which churches were ordered and arranged. Because of this, St George is conventional in design, a hall church with the altar at the east. However, the setting of the church, with a plaza at the west end and an open arcade leading on to it, is reminiscent of the way in which Catholic churches in southern Europe are set organically on town squares, becoming a part of them, and allowing the Faithful to congregate before Masses in a place which is at once a part of the Church and a part of the City. There's something very Catholic about this. A small garden courtyard beside the church separates it from the large presbytery, and beyond that is the car park. I have extremely fond memories of this church. Back in the mid-1990s, the Parish Priest here was also the East Anglian diocesan priest for the deaf, and he regularly held Masses in Sign Language here. At the time, we fostered a deaf girl, and so we would pile up the A140 with her and our own children, who were then both under five, and come to Mass here. It was always the most joyful and deeply spiritual of occasions. It deepened my own Faith, and was certainly one of the experiences which would lead my wife into joining the Church herself. Today, she translates the readings at Mass into Sign Language at our own church. In those days, I remember, we were always welcomed with open arms by the community, as were all outsiders coming in for the Deaf Mass, and the busy presbytery kept open house. I remember sitting in the back garden on a summer afternoon chatting with Bishop Peter Smith, who would later be promoted to the Archbishopric of Cardiff, while my children mixed in with other children, running and tumbling on the presbytery lawn. On other visits to Norwich, I would often make the twenty minute walk from the ring road up to St George, just to sit inside its cool, silent, beautiful peace. It was a difficult church to be alone in - you always felt that you were at the heart of a busy, living, breathing community. I had not been back to St George for about eight years. The friendly Parish Priest I'd known had since moved on to pastures new, and our deaf girl grew up and moved away. I was more often in Norwich these days than I had been then, but I rarely made it out to the Sprowston Road. Indeed, a film of nostalgia had formed across my memories of St George, as so often happens with the recent past, and thoughts of our children when they were young. Now, I felt a mounting sense of excitement as I cycled up Silver Road and then turned onto the busy Sprowston Road, St George's great west front lifting into view above the mundane shop fronts. It is a big church, bigger than any in Ipswich, a town with a larger Catholic community than Norwich. It is at once both suburban, and the obvious architectural heart of its setting. I don't mind admitting that I felt a little frisson as I picked up my bike and carried it up the steps onto the plaza. Curiously, there was nobody else about, and no other bikes in the bike racks. I left my bike, and then walked under the open arcade to the great west doors. Locked. For a moment, I couldn't quite believe it. I had never found St George locked before. I rattled both doors, but I could feel the lock tightening as I pulled the handle towards me. Obviously, there had been a change of policy here - or had someone simply forgotten to open it? But it was eleven o'clock on a Saturday morning - surely a Mass must have just ended? Then I wondered if, these days, people were expected to use the doorway which leads into the south transept. I walked around the corner into the courtyard and tried the handle, but it was as locked as the west doors. I was so surprised, I wasn't sure exactly what to do. I had planned that day to visit the churches of north Norwich, of Sprowston and Heigham, of New and Old Catton. I had counted on this one, at least, being open. Should I head off, and come back again later? I looked around the corner to the front of the presbytery, and saw that there was a car parked there. The obvious thing to do was to go and call at the presbytery. I did not know who the Parish Priest at St George was these days, but I was sure he'd be helpful. I went and rang the bell and waited. Nothing. I pressed it again just to be sure, but I could not hear any ringing noise inside. I stood waiting, and I looked up, and noticed how delapidated the presbytery looked nowadays, unlike in the sunny days of my memory. I waited. Nobody came. All I could hear were the birds in the tall trees to the east, and the traffic on the Sprowston Road. I would have to come back to St George later. I wandered around the church again taking photographs of the outside, but as I stood in the car park taking the photograph you see at the top of this page, I saw out of the corner of my eye - I swear to you - a movement in the big central window of the presbytery, a figure walking across out of the room. It struck me then that the bell, obviously, had not been working. My heart gladdened as I walked briskly back across to the presbytery, and this time I walked down to the other door and rang the bell there, and walked back up to the main door. As I did so, a very large man walked into kitchen and glared at me. I could tell as soon as he opened the door that he was not happy with me. It wasn't just the look on his face, but the way he said crossly "What do you want?". I explained my mission, who I was, mentioned that I was a Catholic, and told him that I'd like to see inside the church; but, unaccountably, it was locked. He stared at me for a moment, and then said "And I'd like to know why you are skulking around outside my house". Well, he had a point, so I explained the problem with the bells - or, at least, what I had perceived as the problem with the bells. He then said something extraordinary, in a thunderous voice. "If someone rings on my bell and I don't choose to answer it, then it is for a good reason!" Obviously, I apologised, and again explained the nature of my mission. Well, without going into too much detail, all I can say is that he was extremely rude to me - outstandingly so. I have never in my life before experienced such unpleasantness and hostility from a minister of religion. His main complaint appeared to be that I had rung on his doorbell while he was in the toilet, which was candid of him to say the least. Yes, the church was locked, and it would stay locked. No, I couldn't go inside. No, it wouldn't be open today. No, I couldn't go inside even if I came back later. If I went away and made an appointment, then he would consider it, but not today. He was extremely busy. Saturday was an extremely busy day for him. He was also infirm, and he couldn't be expected to be at everyone's beck and call. The fact that I had come all the way from Ipswich was not his problem. This haranguing was so intense it was difficult for me to get a word in edgeways. Although I was sorry that I had disturbed him, I didn't think I deserved this attack, and so I decided to go. I managed to apologise once more, and he replied, rather oddly in the light of what he'd just told me, that he too was going now because he was halfway through a phone call. And the door was shut firmly in my face. Rather shaken, I made my way back to my bike, my knees a little weak as I cycled off in the direction of St Cuthbert. It was only thinking about it afterwards that it struck me as extraordinary. Here was a major urban Catholic church in a significant English provincial city. At this time on a Saturday morning it should have been full of life. What had happened here? I couldn't marry up my own memories of St George a decade before with what I found here now. Liturgically, a Catholic church should be open. This isn't always possible, but it should at least be accessible. It should be considered desirable for any passing Catholic to enter into the presence of the Blessed Sacrament to pray. In years and years of visiting hundreds and hundreds of churches, I have never been refused entry to a Catholic church before. Thinking about it, it made me quite cross. Anyone, of any faith or none, should be able to call at a Catholic church and expect warmth, friendship, support and encouragement. I thought that this man's behaviour had been outrageous. It was only when leafing through the Diocesan handbook the following day that I was struck by something else rather extraordinary. I hope that you will forgive me here for a little number-crunching - I don't normally go in for counting bums-on-seats at the churches I visit. But East Anglia is a tremendous growth area for the Catholic Church. Congregations are burgeoning, the pews are filled with young families, the communities are regularly augmented by migrant workers and those leaving other denominations to find a new spiritual home. But glancing down the census statistics for 2007, the most recent year for which they are available, there seemed to be something wrong. I got out the statistics for 2003, the most recent other year I had to hand. My suspicion was correct. While most East Anglican Catholic churches had increased their congregations considerably over the four year period, the average Sunday Mass attendances at St George had actually gone down in that time, from 765 to 602 - that is to say, one out of every five people who had been attending this church in 2003 had gone somewhere else by 2007. To compare, I looked at an equivalent church in some other towns, which is to say a big suburban church which complements the main central church, as St George does the cathedral in Norwich. So, for example, the church of St Mary in the eastern suburbs of Ipswich had gone from 594 Sunday worshippers in 2003 to 758 of them in 2007. In Cambridge, St Lawrence had gone from 654 to 728, and St Philip Howard from 566 to 691. None of these are the main central Catholic church in their town. The Diocesan handbook also lists the resident Catholic population of these parishes. 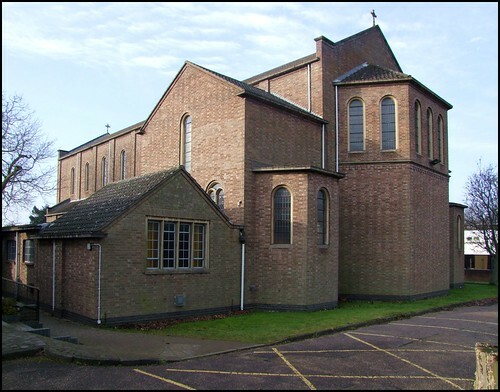 In 2007, Ipswich St Mary drew its crowd of 758 from a local population of an estimated 2700 Catholics, but the Catholic population of St George's parish in 2007 is given as 5500, more than twice as many! It all seemed very odd, and you will, I hope, forgive me in the light of my experience here for wondering if there was some kind of connection between St George's falling attendances and the way in which I had been treated as a visitor; and, if so, which one was a symptom of the other. I'm sure that someone will write and tell me. My heart wasn't heavy for long. I spent the rest of the day visiting churches across north Norwich, meeting some lovely people, and found myself most welcome in many places. But I still kept thinking about St George, and how I was going to write about it. I finished the day in my favourite Norwich church of all, the Catholic Cathedral of St John the Baptist on Earlham Road. This vast space always moves me. I sat for a while, and wandered around the transepts, and then popped into the shop. I suppose that there were only about half a dozen other people in the Cathedral, and the nice man who works in the shop observed that it was "a bit quiet this afternoon". I agreed, and we got to chatting about the way in which the Cathedral was increasingly a part of the mainstream of Norwich life, and how people are far more likely to pop in for a look than they were, say, ten years ago. We talked about other Norwich churches we liked. I didn't mention my unpleasant experience at St George earlier in the day; but nor, I realised afterwards, did I mention St George as one of my favourite Norwich churches, as I certainly would have done the previous day. The Catholic Cathedral is open every day from seven in the morning, but of course there are special days when the open building is advertised, and visitors can go on guided tours. The man in the shop told me how he had been one of the welcomers to the Cathedral on September's Heritage Open Weekends. "You wouldn't believe it", he told me, "but some people come up those steps and they say 'we're not Catholics, can we still come in?' - Well, I have to smile. Of course you can, I say, this is God's House, all are welcome, everyone is welcome here! And when they leave, some of them come up to me and they say 'you know, we hadn't known it was going to be so wonderful. We just didn't know what it was going to be like.' because some people still have some funny ideas about Catholics, and there's still a stigma. But some of them come back, some of them come back for a look around on their own, and you just know that some of them are going to be open to the presence of God, don't you?" I was silent for a moment, because I knew he'd just written the end of this article for me. We agreed that an open church was the greatest single act of witness that the Church has today. And then I headed home.